Spring weather has briefly visited us this week, though the cold is coming back soon. But invariably we're seeing the first signs of Spring everywhere. This weekend the first osprey was spotted locally, geese are migrating, red-winged blackbirds are singing out their territories, and I heard a lone spring peeper. With thoughts of spring it's a good time to make you aware of a wonderful resource for citizen science. The website Journey North is designed as a tool for individuals and classrooms, as well as informal educators, to use for tracking seasonal changes and migrations. The term for tracking the seasonal life cycle changes of plants and animals is called phenology. 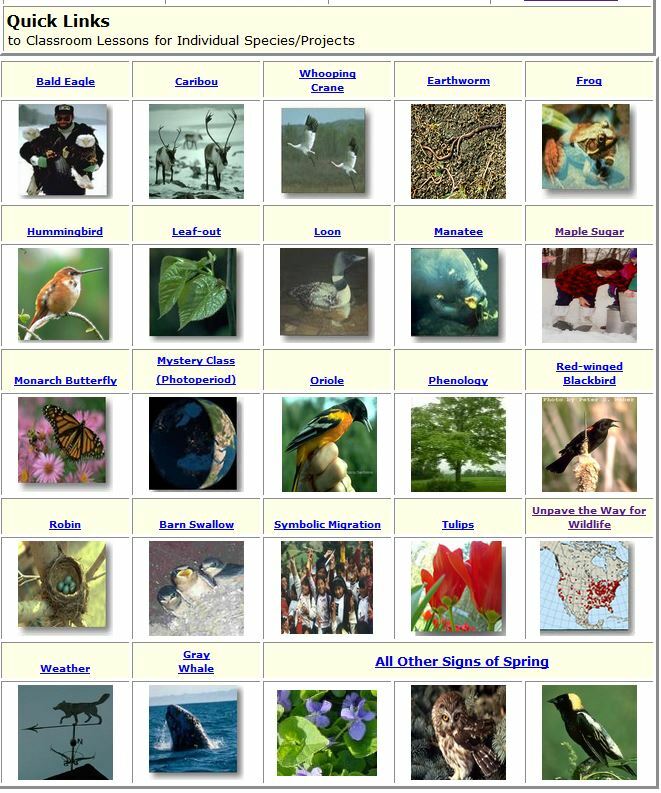 This website provides the tools to track the phenology of robins, humming birds, whales, barn swallows, worms, first leaf-out, eagles, flowers blooming, caribou, whooping cranes, and so much more. They also specialize in providing tracking maps and information for recording seasonal changes in sunlight and weather. Examples of projects found on the Journey North website and "teaching" pages. Posted in Birding, Birds, Citizen Science, Insects, Invertebrates, Reptiles and Amphibians, Science Activites for Kids, Teaching Materials and tagged citizen science, Journey North, phenology on March 7, 2014 by Infinite Spider. Each year brave and intrepid birders go out into the cold and snow to count birds for the Christmas Bird Count (CBC) with the National Audubon Society. Starting December 14th and going through December 1st people choose to join local birders from their region to help on one day during this rage. Participation is free and you can search for local clubs doing the count on this web page: http://netapp.audubon.org/CBC/public/default.aspx. Posted in Birding, Citizen Science and tagged Birdwatching, Christmas Bird Count, citizen science on December 14, 2013 by Infinite Spider. It's not often that I come across well organized and useful sites that pulls together science resources globally and locally, but SciStarter (http://scistarter.com/) is one. For me, this is a five star website. Scistarter has been featured in Discover Magazine, NPR, WIRED, and BBC. On it's face it looks very simple, a searchable site for citizen science projects to get involved with. Posted in Citizen Science and tagged citizen science, Online Science Pograms, Science Programs, SciStarter on November 8, 2013 by Infinite Spider.